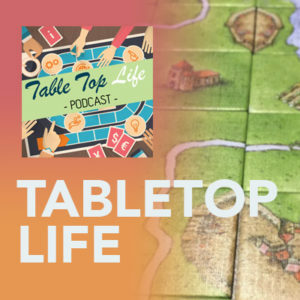 The TableTop Life Podcast is a deep dive into the exciting and quickly expanding world of tabletop games. We’re not talking Monopoly here – we discuss everything from major titles to Kickstarter games. Most episodes are less than an hour and amongst other things, prominently feature one game. We discuss the mechanics and details of the game, including how to play, from both sides of the table – an expert gamer and a newcomer. The TableTop Life Podcast is available on iTunes, Stitcher, Google Play and YouTube.